A donkey suicide bomb and a farmyard massacre – two examples of how nonhuman animals have become targets in the current war between Israelis and Palestinians. My brothers and I have lost 100 dairy cows and 70 oxen for meat, as well as several camels ... This is a family business that we have inherited from our father, who built it up from money he earned working in Saudi Arabia. It's all we know. A donkey suspiciously began to approach forces. The forces approached the donkey and it exploded at a safe distance, whereas no injuries were sustained by the IDF as a result. One animal who has made it out of the fighting alive is a long-eared owl who'd been injured by mortar shrapnel and rescued by a veterinary student at a kibbutz near the Gaza border. The owl had shrapnel in his head, a broken beak, and no vision in his right eye. Last we heard, he was doing better and may be able to be returned to the wild at some future time. 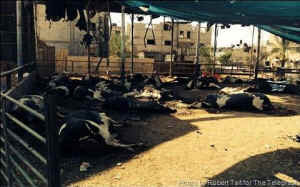 Donkeys, horses, cows were scattered at the edges of fields and in the marketplaces. The farm towns at the edges of Gaza are where the shepherds live, and in the shelling they were forced to abandon their flocks. Down one lane, two men carried a cage filled with songbirds. All across Gaza, the dead bodies of donkeys, horses and other animals litter the streets. No one knows how many dogs and cats lie buried under rubble or how many farmed animals have been blown up or abandoned to die. Or what's happened at the zoo. We'll never know the harm to wildlife caught up in the crossfire or mown down by tanks, and the overall carnage and terror that the war will have wrought on all living creatures. And, incidentally, anyone who thinks that "we" (as opposed to "they" over in that part of the world) don't behave exactly the same way toward other living creatures when we go to war is just kidding themselves. We do the same and much worse – from the carnage of the American war machine plowing across the fragile desert environments of the Middle East, to the vivisection laboratories back home, where we try out weapons of war on live animals – especially pigs, whose skin and other organs are quite similar to those of humans. Perhaps, in some parallel universe, there are humans who have learned to consider the effect their endless wars have on their fellow creatures, and who have decided to resolve their differences in a less selfish way. Update: This photo of a Palestinian boy and his cat was taken by a doctor at the Shifa hospital in Gaza. The boy has lost all his family members. The doctor tweeted: "Sleeping on the floor at Shifa hospital was this kid. The only thing that survived from his home was his cat. #Gaza."